Yolanda "YoYo" Whitaker, deemed one of the most sophisticated female hip hop artists of our time, can be seen performing her classic "You Can't Play with My Yo-Yo" in the 2008 BET Hip Hop Awards. In a long overdue tribute to the women of hip hop, YoYo, MC Lyte, Lady of Rage, and Salt N Pepa are rumored to have "stolen the show." 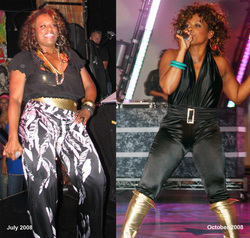 Hip Hop icon YoYo Whitaker attributes her form at the 2008 BET Hip Hop Awards (right) to SLIM ShotsTM and exercise. Yolanda "YoYo" Whitaker, deemed one of the most sophisticated female hip hop artists of our time, can be seen performing her classic "You Can't Play with My Yo-Yo" in the 2008 BET Hip Hop Awards. In a long overdue tribute to the women of hip hop, YoYo, MC Lyte, Lady of Rage, and Salt N Pepa are rumored to have "stolen the show" held last weekend in Atlanta. YoYo, whose music has a feminist tack, is a pioneer in lyrics encouraging young women to show sexual restraint and to use their minds before their bodies. Today, YoYo attributes SLIM Shots and exercise with helping her get back in performance shape. "This is my shot," said YoYo of her new body and her appearance on the Awards program, adding, "and I'm takin' it." Catch YoYo on the black carpet and performing in the tribute to the Women of Hip Hop in the 2008 BET Hip Hop Awards program airing throughout the month. Check your local listings for dates.